Acronym for United States Marine Corps. 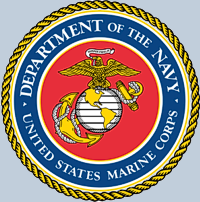 The USMC is an amphibious, expeditionary, air-ground combined arms task force, capable of forcible entry from the air, land and sea, for the purpose of national defense and international military obligations as directed by the United States President. It was founded to serve as an infantry unit aboard naval vessels and was responsible for the security of the ship and her crew by conducting offensive and defensive combat during boarding actions and defending the ship's officers from mutiny. To facilitate this duty, their quarters on ship were often strategically positioned between the officers' quarters and the rest of the vessel. Today, the basic framework for deployable Marine units is the Marine Air-Ground Task Force ( MAGTF ), a flexible structure of varying size that integrates a ground combat element (GCE), an aviation combat element ( ACE ), and a logistics combat element ( LCE ) under a common command element ( CE ). The most notable USMC officer to become involved in ufology was Major Donald E. Keyhoe ( 1897-1988 ). Although Keyhoe had written some paranormal based fiction during the 1920s and 30s, his views regarding the reality of alien visitation were skeptical. Then in 1949, True Magazine asked Keyhoe for an article about UFOs ( then called flying saucers ). Keyhoe did some research and made some inquiries with military officials. After some investigation, he became convinced that flying saucers are real. He also believed that because their design, maneuverability, speed, and illumination were far ahead of any earthly achievement, the saucers must be of alien origin. Also, because the military constantly downplayed the phenomenon and was both evasive and contradictory when interviewed, Keyhoe also became one of the first to believe in an official UFO cover-up.